How are library services developing their work with reading groups? For over a year now, we have been conducting a small-scale inquiry into reading groups and what libraries do to support them. Our interest was sparked by our own experience of the value of coming together to talk about our reading and awareness of the huge expansion of reading groups in recent years. With help and support from key people in the Society of Chief Librarians and The Reading Agency, we made contact with the chief librarians of a number of library services and asked to be put in touch with the person with overall responsibility for reading groups. Through these contacts, we heard about the changing role of libraries and how reading groups were an important way of helping them to fulfil these new expectations to reach out to adults with differing backgrounds, interests and needs. We learnt about the wide variety of reading groups increasingly on offer, including staff reading groups, multi-cultural groups, father and son groups, thematic reading groups and young mothers' groups. We also documented the work that libraries do to support reading groups behind the scenes, as well as facilitating groups and setting up new groups in response to local needs. Talking with facilitators, we learnt about the high level of skill and sensitivity required to lead some groups, with volunteers valuing the quality of the training and support they received. We met with reading group members to explore their views about why they had joined the group and what they felt they gained from being a member. What they told us confirmed the value that the library staff said they place on reading groups. As shown in other studies, members were universally positive. They said that as well as heightening their enjoyment of reading, being a reading group member was good for their well being. As well as the discussion, they looked forward to getting out of the house and to the camaraderie. Reading groups could lift people's mood, develop their confidence and generate a strong sense of community, mutual support and empathy. If more people are to be engaged in reading for pleasure, one manager told us, it is important 'to go out to them'. Among the library services we visited, many different approaches were being used to engage people in reading as a first step towards membership of a reading group. 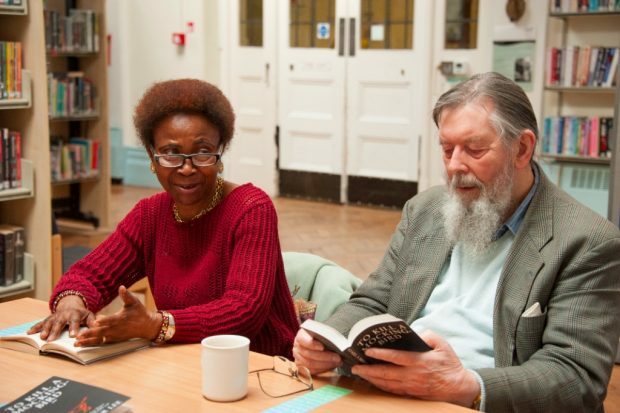 Reading groups were being set up in a variety of locations other than libraries; for instance in work-places, care homes, community centres and prisons. A virtual group was evolving through a link between the library and local radio. It is not just where the group takes place but what happens in the reading group meeting (the process) that counts.The process affects who chooses to come and who can participate fully. In addition to more usual formats, we heard about Shared Reading groups, where a chosen text is read aloud in the meeting. People engage there and then with short sections of text, and a linked poem, with a trained facilitator enabling them to share their thoughts and feelings. Approached in this way, great literature is potentially accessible to everybody. It was suggested to us that including Shared Reading as part of libraries' reading group offer could play a major role in enabling reading group provision to be more fully inclusive. The library managers we talked to emphasised strongly how important it was to build partnerships of different kinds with local community groups, colleges, arts organisations, charitable groups, etc. in order to sustain and extend what libraries could do alone. Awareness of the benefits of reading groups to people's health and well-being had led to major, jointly-funded, initiatives with health and welfare services and with adult social care. One library service was part of a Local Authority-wide long-term strategic partnership aimed at combatting poverty and fostering social inclusion. We consider that reading groups are a vital means to achieving some of the central purposes of libraries that are outlined in the consultation paper. We are therefore surprised that, as a strategy, they receive no direct mention in the paper. If we believe that reading will continue to be a critical skill and that enjoyment is a key determining factor in developing reading skills (as stated in Annex 1 of the Paper), then reading groups should be a central and integral part of any strategy for future development. Not only do they heighten the enjoyment in reading as participants in this and many other studies have confirmed but, more fundamentally, they are microcosms of community. People participate together on an equal footing and gel into a group that cares for and supports one another. As one reading group facilitator put it: "If it's done right, it does fulfil a basic human need for interaction and (..) being heard." Our study is being carried out with the support of The Reading Agency and the Society of Chief Librarians. Lesley Dee, was a Senior Lecturer in Inclusive Education at the University of Cambridge Faculty of Education. She has a background in Further and Continuing Education. Susan Hart was also a Lecturer in Education at the University of Cambridge Faculty of Education. Since retiring, she has continued to be involved in educational research projects located at the Faculty. Cathy Jennings is an editor and former adult education teacher with broad experience in educational publishing. Shared Reading Group, Boston, Lincs. A full report of our research is in preparation. Ambition consultation complete - what happened and what's next?